Cape Fear Investigative Services, Inc. is a licensed Private Investigation agency serving Wilmington and Jacksonville, NC as well as the surrounding Southeastern North Carolina region. We provide a full range of private investigation services to the legal profession, government agencies, insurance companies, small businesses and private individuals. Experienced private investigators with more than 100 years combined law enforcement experience in the state of North Carolina, we have the resources and training to find the truth behind each case. All investigative evidence is handled properly to ensure the resulting testimony is unquestionable. Our private investigators use only ethical means to obtain information, from surveillance-with state-of-the-art equipment to interviews and background checks. Private Investigation above and beyond: Trust us to get to the bottom of your investigation. We aggressively pursue every legal avenue available to us to find the information you need. Your case will be handled thoroughly, discreetly and professionally. Follow us on Facebook and Twitter! 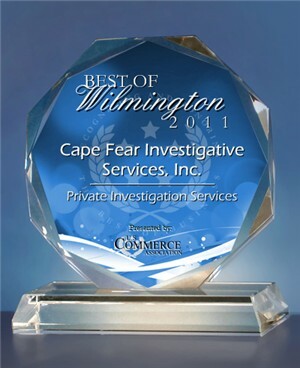 Cape Fear Investigative Services for good tips and updates!